Escapada Health Retreat brings together the unique and powerful combination of Traditional Chinese Medicine and Ayurveda. There is no right or wrong or good or bad, but there is the noble middle way, a central idea in both medical systems, which avoids long lasting extremes in our nutritional behaviour, our life guidance and mental states. By combining the wisdom of these two eastern philosophies, our aim is to explore basic ancient principles and knowledge to simplify and improve life: the way we eat, the way we think, and the way we live. Your daily stresses, lifestyle choices and injuries can upset our natural balance and lead to physical and emotional symptoms. With Chinese medicine and Acupuncture, we can begin our journey to better health. We rebalance body and mind and therefore often prevent minor or major ailments. Traditional Chinese medicine is one of the oldest continuous systems of medicine in history, with recorded instances dating as far back as two thousand years before the birth of Christ. While acupuncture is the most often practiced component of traditional Chinese medicine, one should know that it is only one important piece of a much larger puzzle. Traditional Chinese medicine encompasses several methods designed to help people achieve and maintain health. Along with acupuncture, TCM incorporates adjunctive techniques such as acupressure and moxibustion; manipulative and massage techniques such as tuina, cupping and gua sha; herbal medicine; diet and lifestyle changes; meditation; and exercise (often in the form of qigong or tai chi). At the Escapada Health Retreat we offer Integrated Chinese Medicine, a system that combines Five Element Constitutional Acupuncture and Traditional Chinese Medicine (TCM). This means your treatment acts on a physical and mental as well as constitutional level. Due to its complexity, Chinese medicine seems difficult to comprehend. TCM is based, at least in part, on the Daoist belief that we live in a universe in which everything is interconnected, another way to put it: we are the microcosm within the macrocosm. What happens to one part of the body affects every other part of the body. The mind and body are not viewed separately, but as part of an energetic system. Similarly, organs and organ systems are viewed as interconnected structures that work together to keep the body functioning. Many of the concepts emphasised in TCM have no true counterpart in Western medicine. One of these concepts is qi (pronounced "chi"), which is considered a vital force or energy responsible for controlling the workings of the human mind and body. Qi flows through the body via channels, or pathways, which are called meridians. There are a total of 20 meridians: 12 primary meridians, which correspond to specific organs, organ systems or functions, and eight secondary meridians. Imbalances in the flow of qi cause illness; correction of this flow restores the body to balance. Other concepts (such as the Yin/Yang and Five Element Theories) are equally important in order to have a true grasp of traditional Chinese medicine, and will be discussed at length elsewhere on this site. Perhaps the most significant developments in TCM are the concept of Yin & Yang and the understanding of Qi. Yin and Yang represent two opposing forces in nature, which are simultaneously related to one another. Often they are understood as female or lunar and male or solar principles. All the phenomena of nature, every function of our body, and every disease can be divided into yin and yang. -⌲ everything has two sides. -⌲ each yin and yang can be divided into yin and yang. -⌲ yin and Yang are indivisible, they are conditional. -⌲ yin and Yang control each other. -⌲ yin and Yang transform into each other, become mutually interrelated. The dynamic balance of yin and yang guarantees health. An excess is referred to as fullness, a defect as emptiness. Thus, in the event of a disease, a weakened yin must be strengthened or a yang abundance must be removed. Qi in Chinese Medicine is perhaps the most important concept, mostly unspecifically translated as "life energy". Qi is the essence that permeates and permeates everything. In the body, the Qi/Prana move in tracts, the so-called meridians. There are 12 main meridians as well as numerous special meridians. 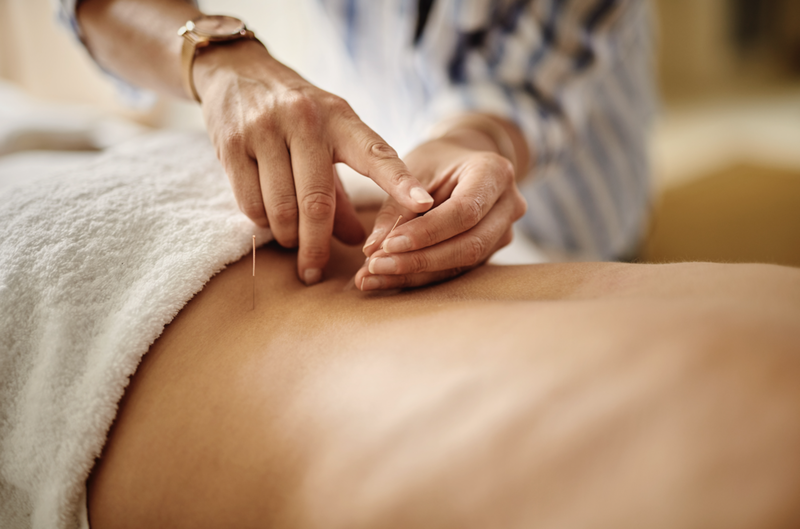 Acu-points can strengthen and move where the Qi accumulates - these are treated in the acupuncture by needles, by heat ("moxibustion") and in manual therapy by pressure, in order to restore the smooth flow. Maintaining these functions for the human body is the central concern of TCM. For increased health- a deficient Qi is strengthened, a possible stagnation is solved and the direction of movement corrected. Five Element theory or five phase theory, is one of the major systems of thought within traditional Chinese medicine. While it is an important component of TCM, today Five Element theory is not used by every acupuncturist. Essentially, this theory is used to help explain the cause of particular diseases, and to associate signs or symptoms to particular organs and afflictions. According to Chinese theory, we are made up of the 5 Elements: Fire, Earth, Metal and Water. They are our creative and controlling energies and ideally should all be in balance. The Element out of balance the most is known as the causative factor and become apparent in many ways (e.g. through your emotions, sound of voice, your complexion and many more). The causative factor is a positive thing and enables us to put together a treatment plan that will treat your causative factor or what Element you represent. This ancient system enables the body/mind/spirit to heal itself, as far as nature will allow. Not only dealing with your condition by restoring the overall balance of energy, 5 Element Acupuncture may help you to feel better in a general way, by promoting an improved quality of life. Many studies are reporting on traditional Chinese medicine's success in treating a wide range of conditions, from nausea and vomiting to skin disorders, tennis elbow and back pain. Many Western-trained physicians have begun to see the benefits traditional Chinese medicine has to offer patients and now include acupuncture - at least on a limited basis - as part of their practice. There is more and more people using acupuncture, herbal remedies and other components of traditional Chinese medicine than ever before. The reasons for this vary, but the interest in and the use of TCM is increasing due to its effectiveness, affordability and lack of adverse side-effects.